Having recently moved house, a bare wall in my daughter’s bedroom was needing some serious attention. My love of interior design came out in force as I pondered for a few weeks what would suit her space. Enter Bookhou to save the day, a Canadian based small business using beautiful renewable materials for their kids line of products. 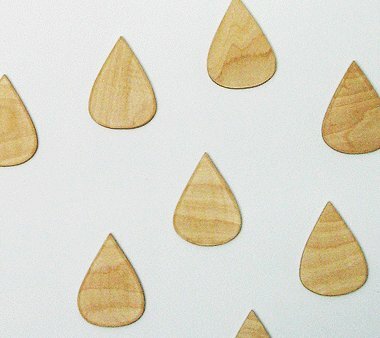 We featured their wares in March 2008 and now their wooden clouds and rain drops made from Baltic Birch plywood have caught our eye. Incorporating whimsy with a timeless flair, the simple cloudy creations will fit in with any decor scheme, whether you’re after a rainy day or just a little shower. I think I want them for our living room! The clouds come in three different sizes with prices ranging from US$35 to US$45. The rain drops are available in a pack of five for US$60. Shipping to Australia is available.